Bartenders and Boxers and Briefs…Oh My! It’s the kind of charitable event that raises eyebrows and lowers underwear. It’s for a good cause, too. “Bartenders, Boxers and Briefs” returns to Georgie’s Alibi Monkey Bar in Wilton Manors July 25 for another night when local bartenders take to the stage, and then take off their underwear. Last year’s event raised thousands of dollars for Tuesday’s Angels, an organization that is dissolving November 30. The group was also chosen by organizers this year. Tuesday’s Angels was known for the Tuesday night dinners it held at Chardee’s Lounge and later Bill’s Filling Station, where a hat was passed around the table for donations. The group of men wanted to help in their own small way by collecting funds to provide a variety of assistance to HIV-positive men, and they did it for 30 years. Read more about why Tuesday’s Angels decided to dissolve here. While their last dinner was in April, the group has said it will continue to provide support for the next 10 years. 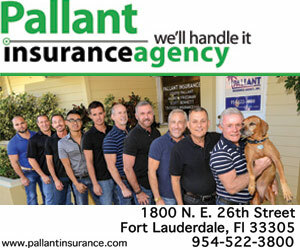 It is doing that by placing its assets and donations in the “Tuesday’s Angels Donor Advised Fund” at Our Fund of Wilton Manors. Money raised at Bartenders, Boxers and Briefs will go directly into the fund. Tuesday’s Angels board members say they have never paid for offices or any administrative expenses (other than an accountant) ever since their founding. That’s allowed 100 percent of donations to go directly to those in need. The event takes place from 7 p.m. to 10 p.m. A silent auction begins at 7 p.m. and the bartender auction starts at 9 p.m. There will also be a raffle. The bartender auction is the highlight of the night. That’s when bartenders from the Wilton Manors area take to the stage and bidders try to claim their prize – the bartender’s boxers or briefs. Once the winning bid is acknowledged, the bartender typically goes behind a towel to take off the bidder’s prize. Last year, bartenders from Hunters Nightclub, the former Progress Bar, LeBoy, Southern Nights, Monkey Business, Boardwalk, Rumors Bar & Grill, newly reopened Scandal’s Saloon, Rosie’s and Mona’s were all sent representatives to have their underwear auctioned. Notable entertainment, other than the bartenders on stage, includes emcees and auctioneers Nikki Adams, Dame Edna and Miss Kitty. Last year Adams, who is a well-known South Florida entertainer, introduced each bartender model to the stage. All three entertainers will likely take turns getting the crowd riled up and opening wallets.